If you have any interest in Robotics or using your programming talents to make things move, other then just on the screen of a computer, Microsoft Robotics Studio is your ticket to doing just that. 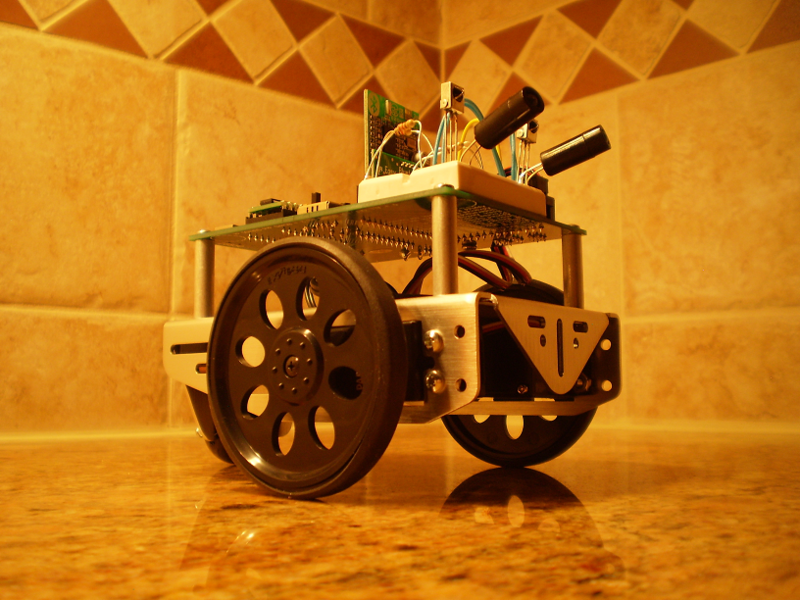 I have just started getting into learning how MSRS works and learning the C# language to program robots. Like so many other people who are interested in programming I typically use Visual Basic to write my programs (its easy to learn, read and is widely used). Older versions of MSRS support the visual basic programming language, however the latest beta release (MSRS 4.0 Beta) will only allow you to program in C#. Through threads I have posted on the MSRS forums the reason for dropping the VB language was that it had not caught up to C#, and currently the features of C# helped developers programming robots to do what they wanted better then visual basic can. Like me there are probably a lot of you who were disappointed to find out this news; but if you are interested in robotics and program in VB only, they have not necessarily wiped out VB, it just may be coming back once the developers have a chance to catch it up to C#. Instead of waiting around for Visual Basic inclusion in MSRS I decided to take the plunge into the world of C#. Since this is what most of the books and documentation on the internet uses, this will likely prove to be a smart decision in the future. My starting point for learning MSRS was buying a $25 dollar book available from Amazon or Chapters/Indigo. It comes straight from the source who developed MSRS: Microsoft. Programming Microsoft Robotics Studio serves as a good basis for learning the software from a complete beginner standpoint and points out how everything works together to get your robot up and moving. 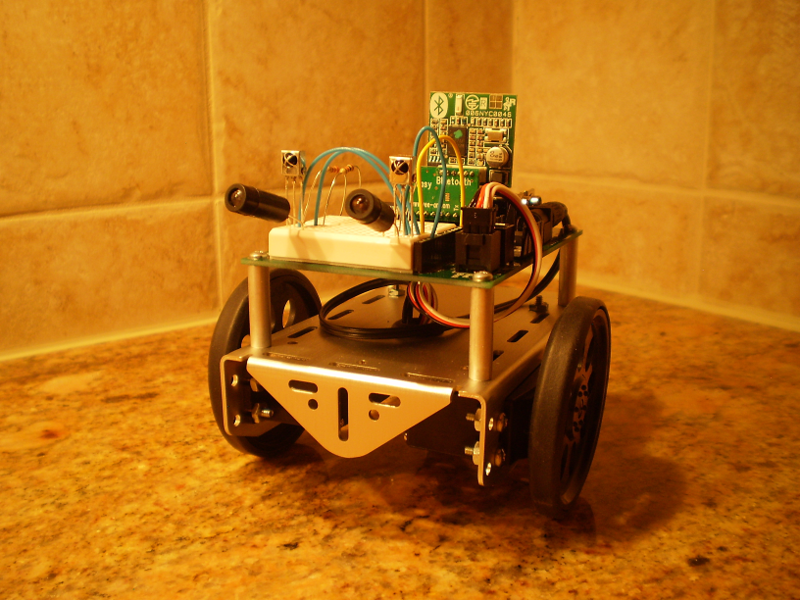 One of the robots that the book suggests using is the Boe Bot Robot, available from http://www.parallax.com . There has been a product change to the Boe Bot since the Programming Microsoft Robotics Studio book was published. They advertise buying the Bluetooth enabled Boe Bot, which is no longer available from Parallax. No need to fret however, you can buy the easy Bluetooth module from Parallax which easily plugs into the Boe Bots's circuit board. The first step in getting the Boe Bot functional with MSRS was to develop Drivers or Firmware for MSRS to interface with the robot. I downloaded the basic stamp editor available from Parallax to do this. Since the Boe Bot uses a proprietary programming language to operate the hardware, that forced me to learn yet another programming language: PBASIC. Luckily this is one of the easiest programming languages to learn, and found myself proficient with it in a couple hours. Programming drivers for the robot as middle-ware was an interesting task. I constantly had to remember to make the program operate the robot, without telling it what to do. The middle-ware needed to allow MSRS to tell it what to do. The result is a program that is very basic and only operates the functions of the Hardware and no more. After deciding to not release the drivers for this project, I came upon an epiphany on how to write the drivers for this project, substantially improving the quality of the drivers. Originally the drivers were broken and only worked 2 commands into the cycle after which they failed to stop working correctly. I spent well over 100 hours on faulty drivers, but using the knowledge from the RC Bot Bot project I was able to create drivers that work indefinitely for the commands you provide it. I'm ready to release the drivers to those who would find them of use. I must say I'm ecstatic that this project finally came to light. You can download the drivers here.